High end and cutting edge will be the key words at the first China International Import Expo, which will be held in Shanghai in early November. 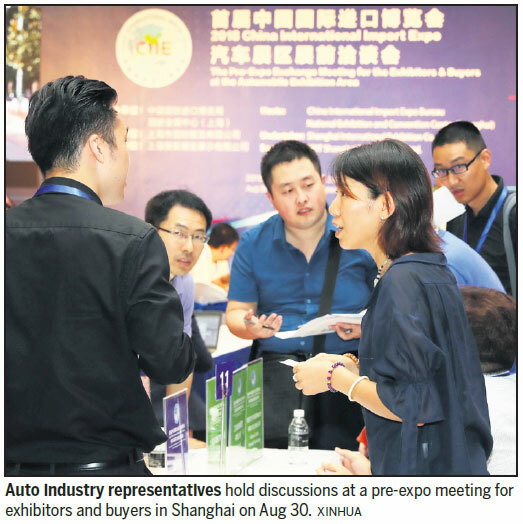 During the two matchmaking meetings for exhibitors and buyers specializing in the service trade and automotive industries on Aug 30, which were the last two of their kind before the CIIE, more than 200 companies expressed their procurement demands and heralded their latest technology breakthroughs to be shown at the exhibition. Startup company AeroMobil from Slovakia will make its debut in China at the CIIE. Its key product, the flying car - which can be converted from a car to a plane - is now ready for preorders. German car parts maker ZF will bring to the CIIE its recently developed supercomputer for cars named Pro AI. The product enables vehicles to understand their surroundings by using deep learning technology to process and interpret all available data from its perception system. According to Joyce Cheng, head of communications for the Asia-Pacific region at ZF (China) Investment Co Ltd, the Pro AI product has been developed to embrace the coming of age of self-driving cars. The product is now ready for mass production. "The Chinese automotive industry develops so rapidly that the time allowed for production development is relatively short," she says. "Therefore, we would like to demonstrate our solutions to Chinese clients and discuss the feasibility of various plans within shorter time periods at the CIIE." Swedish carmaker Volvo will demonstrate its new energy vehicles at its 800-square-meter stand at the CIIE. It will also introduce its self-driving technologies and smart transportation solutions at the exhibition. "We are studying China's rules and regulations with the help of local government departments in the hope of bringing future transportation solutions to China as soon as possible," says Zhao Qin, vice-president of corporate communications for Volvo Asia-Pacific. Gu Chunting, deputy director of the Council for the Promotion of International Trade Shanghai, says that more than 20 carmakers and 40 parts suppliers will showcase the latest technologies and products representing the future of the automotive industry, particularly self-driving, hydrogen fuel cell and power systems. Geneva-based inspection, verification, testing and certification company SGS will demonstrate its service that helps consumers read various product reports by scanning QR codes. It will also showcase its latest unmanned laboratory at the show, which improves the inspection efficiency for automotive products by 20 percent and the precision rate by 50 percent, says Zeng Xiaohu, general manager of the industrial, transportation and fire control businesses of SGS China. "We used to help Chinese companies meet standards and market entrance requirements for overseas markets. But now we are seeing an increasing number of overseas companies, especially small and medium-sized enterprises, wishing to come into China," he says.